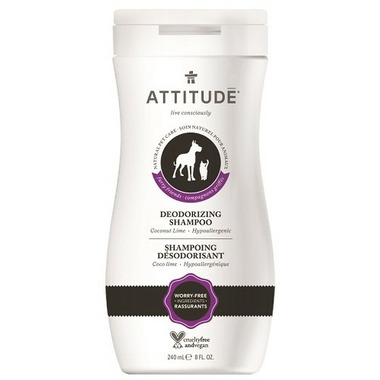 ATTITUDE Natural Pet Deodorizing Shampoo is specifically formulated to deodorize your animal’s fur while leaving it soft and healthy. This all-natural, hypoallergenic, and lightly scented coconut-lime shampoo is effective and safe without leaving harmful residue your pet might ingest while licking. Let your pet’s beautiful coat shine! Directions: Wet fur, apply shampoo, lather, then rinse thoroughly. For maximum efficiency, use with ATTITUDE Furry Friends conditioner.